Parking: Large lot in back. Dress Code: The more comfortable, the better. From the front, where it faces one of the busiest thoroughfares in Savannah’s historic district, it doesn’t look like much. Leoci’s could be a small, 1970s-era trattoria. But if you’re yearning for heaps of overcooked pasta and mediocre meatballs, keep going. Turning down the side street to the parking lot reveals Leoci’s first surprise: A big, tent-shaded deck, cooled by large fans, sprawls into the back lot. Unpretentious comfort is key – grab an extra pillow if your seat isn’t comfy enough, and in fall and winter, bask in the warmth of standing heaters (you can even borrow a throw for your shoulders or lap). For muggy dog days and nights, a small, air-conditioned dining room awaits. Despite Savannah’s lush beauty, it’s rare to eat outside in summer. Leoci’s reminds you how pleasant it can be, aided by nothing but being still in the shade and a fan’s breeze, especially in the cool of the twinkle-lit evening. Wherever you land, you’ll soon discover the restaurant’s next secret: the food. Chef Roberto Leoci, formerly of Bull Street Chophouse, has crafted an extensive menu for this hardworking restaurant, serving lunch, dinner, a long list of specials and $12 express lunches, as well as an extensive wine list, with many options by the glass, and several beers, including the Italian Peroni. 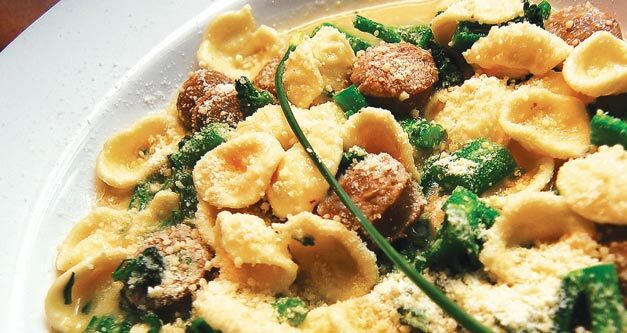 Most pastas and several entrees are available in half-orders. The black-clad waiters are knowledgeable and speedy, and the fare matches the unfussy, comfortable atmosphere with simple but sophisticated food, from the handmade pasta to the wood-grilled pizza, grilled paninis and entrees like whole roasted trout and slow-cooked pulled pork. Specials often include more ex-otic ingredients, like Wagyu beef, lobster and duck, as well as familiar fare like pasta Bolognese, with locally raised beef, pork and veal in Sweet Grass Dairy cream. Leoci’s clean, clear Italian flavors represent a refreshing twist from the current Savannah trend toward heavier, Paula Deen-inspired Southern fare. It begins with the rustic bread, served with olive oil and balsamic vinegar for dipping. A beet salad composes slices of yellow-tinged roasted red beets with a few pickled spheres, dribbled with housemade tarragon vinaigrette and a pile of pretty parsley microgreens. A parmesan-dusted caesar is crisp and garlicky, with anchovies served as requested, on the side. The menu’s list of local sources includes familiar Georgia names like Swainsboro’s Flat Creek Lodge and Brooklet’s Hunter Cattle Co., but also Savannah’s Bethesda Academy, one of the country’s oldest homes for boys, now teaching organic farming. Wild mushroom risotto anchors both the “brick oven” whole roasted trout and the succulent roast pork. Bone-in cooking makes all the difference, even in fish – you’ll be reminded of how flavorful this simple, oil-drizzled preparation can be. The pork, however, is a more complex and wholly successful enterprise, served in tender, pulled strands like barbecue, but with a deeper basso profundo – especially when paired with a rich veal demi-glace. For dessert, perhaps you’ll opt for some fresh berries and ice cream or the tiramisu, or maybe in this heat you’ll be happy to nurse the last few sips of a good dry rosé, its cool perspiration beading your glass. Leoci’s proves that a lot of hard work goes into eating this easily, this simply and this well.